The Samsung Galaxy S7 S-View Flip Cover protects your screen when it is not in use and is easily flipped open for full access to the screen. When closed, the S-View cover offers instant access to critical features through a unique window interface, thanks to the Samsung ID chip. View the home screen to check the time, weather and other status items. Accept or reject incoming calls with just a swipe, or reject calls with a preset message. Control your music playback directly on the S-View screen. If you miss anything, notifications are shown in the recent activity menu of your S-View cover. Swipe the right icon to quickly access your phone's camera, without opening the cover, to quickly take pictures or video to capture the moment. Swipe the left icon to access your favorite contacts for easy dialing with your flip cover closed. 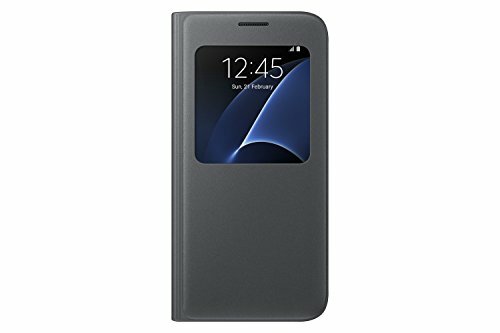 NOTE:This case does NOT fit S7 EDGE.